A supercomputer that can perform more than 250 trillion calculations per second is powering the UO’s leap into data science as the heart of a new $2.2 million Research Advanced Computing Services facility. Known as Talapas, the powerhouse mainframe is one of the fastest academic supercomputers in the Northwest. Its computing horsepower will aid researchers doing everything from statistical studies to genomic assemblies to quantum chemistry. Talapas, the high-performance supercomputing cluster at the heart of the UO’s new Research Advanced Computing Services center, takes its name from the Chinook word for coyote. It’s a name that the center arrived at in consultation with the Confederated Tribes of the Grand Ronde. It follows a Northwest convention of using American Indian languages when naming supercomputers. The University of Washington has its Hyak computer, which means fast in Chinook, and Washington State University has its Kamiak computer, named after Chief Kamiakan, a leader from southeastern Washington. Maggio pointed to a Grande Ronde Chinuk Wawa mobile language app, available for Android or iPhone, that can help people learn the correct pronunciation of Talapas. The new center, which opens officially Dec. 6, is already available to faculty members who register as principal investigators or to members of registered research teams. The center, known by the acronym RACS, offers access to large-scale computing and will soon add high-speed data transfer capabilities, support for data sharing and other services. In addition to boosting the university’s capacity for big data, the new center opens new doors of discovery for faculty across the spectrum of disciplines, schools, colleges and departments. Director Nick Maggio says the center will also help train students for the careers of tomorrow and make the UO more competitive in recruiting new faculty and securing research funding. Talapas is 10 times more powerful than its aging predecessor, ACISS. In just the first few months of testing, the center has helped faculty members performing molecular dynamics simulations, image analysis, machine learning, deep learning and other types of projects. Bill Cresko, a professor in the Department of Biology who serves as an associate vice president for research, directs the UO’s Presidential Initiative in Data Science. He points to the high-performance computing center as a crucial element of the initiative. The center will bring together existing faculty and recruit new faculty across the UO’s schools and colleges to create new research and education programs. The center and the initiative are funded through the $50 million Presidential Fund for Excellence announced earlier this year by UO President Michael Schill. The Research Advanced Computing Services center has a staff of four that includes Maggio, a computational scientist and two system administrators. Among other things, the team has been tasked with transitioning users off of the old system and bringing researchers up to speed with the powerful new technology. The center is one of nine research core facilities supported by the UO’s Office of the Vice President of Research and Innovation. 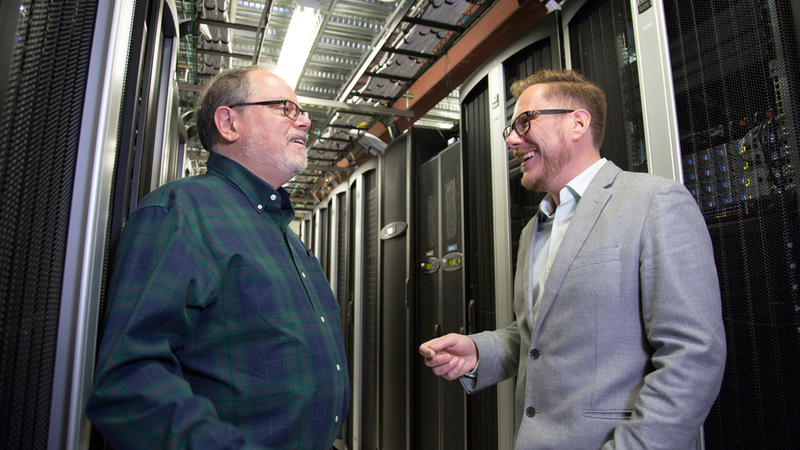 Although the machine is physically located in the basement of the Allen Hall Data Center, researchers from any department can sign up to access its services from their desktops. Increasingly, Maggio said, researchers who previously didn’t use such computational approaches are becoming computational researchers after encountering new research projects that quickly overwhelm the limits of their local resources. Maggio credits Schill and the UO Board of Trustees with seeing the importance of high-performance computing and prioritizing the funding and creation of the new center in under two years. Joe Sventek, head of the Department of Computer and Information Science, led a faculty committee that developed plans for acquiring the computational hardware, implemented the hiring of key staff such as Maggio and helped launch RACS — all in record time. “The fact that Joe and the committee completed this task so quickly is simply amazing,” Conover said. Looking to the future, Maggio envisions more and more researchers accessing the new facility. Already, more than 300 different lab members from nearly 80 labs have requested access, and high-performance computing will likely play an increasing role in powering new research initiatives, such as the Phil and Penny Knight Campus for Accelerating Scientific Impact. To request access to large-scale computing resources, contact the Research Advanced Computing Services center at racs@uoregon.edu.